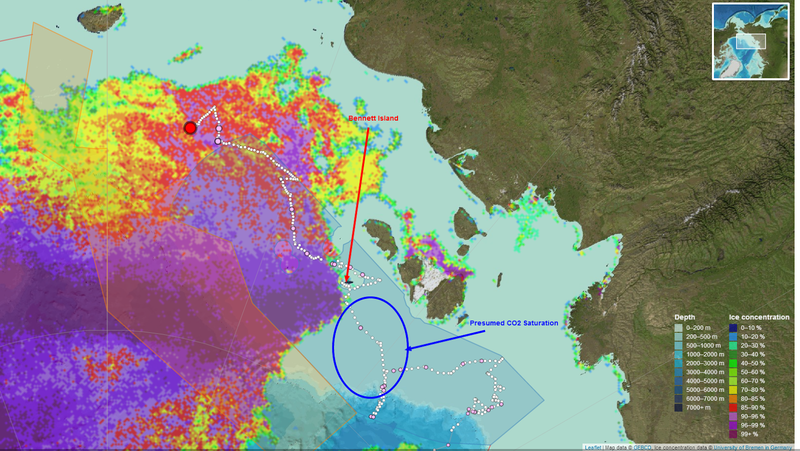 The SWERUS-C3/Oden course, with Bennett Island and presumed area of CO2 release marked. While my primary interest is Arctic methane sources and release, something far more troubling has been found. Here is the "norm" and then the trouble. Even if carbon dioxide emissions were to be brought to a halt today, it would take tens of thousands of years for the oceans to return to the acidity levels they had before the industrial era began two centuries ago, according to Norwegian researcher Richard Bellerby, the main author of a scientific study on the subject." However, a study by MIT gave a more refined perspective of the Arctic Ocean as carbon sink, and ever increasing acidificatio. What their research revealed was that during 2005 through 2007, and continuing in areas like the Barents Sea, as ocean water warmed, it began to absorb less CO2 - and then began to release it. The paper by Stephanie Dutkiewicz and co-authors Mick Follows and Christopher Hill of MIT, Manfredi Manizza of the Scripps Institute of Oceanography, and Dimitris Menemenlis of NASA's Jet Propulsion Laboratory, published in the journal Global Biogeochemical Cycles. demonstrated this finding. 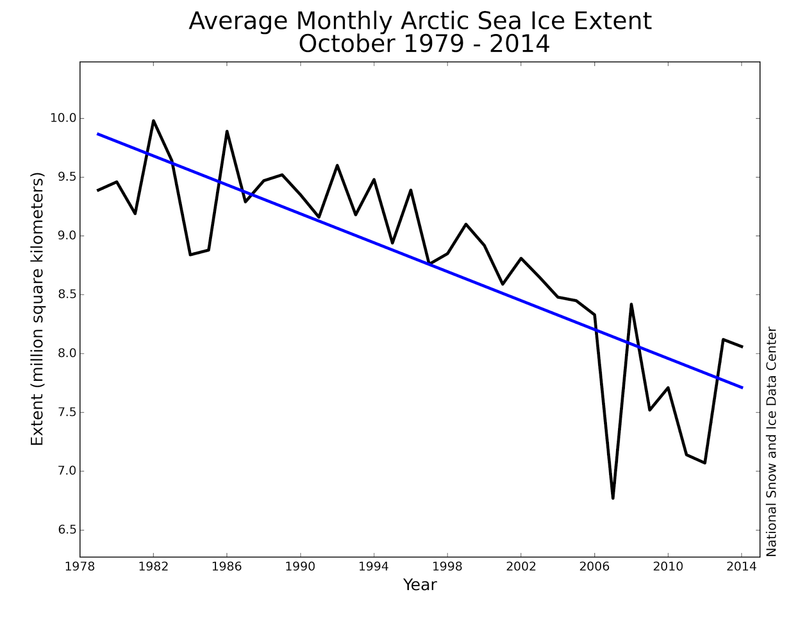 "Manizza found a discrepancy between 2005 and 2007, the most severe periods of sea ice shrinkage (at that time). 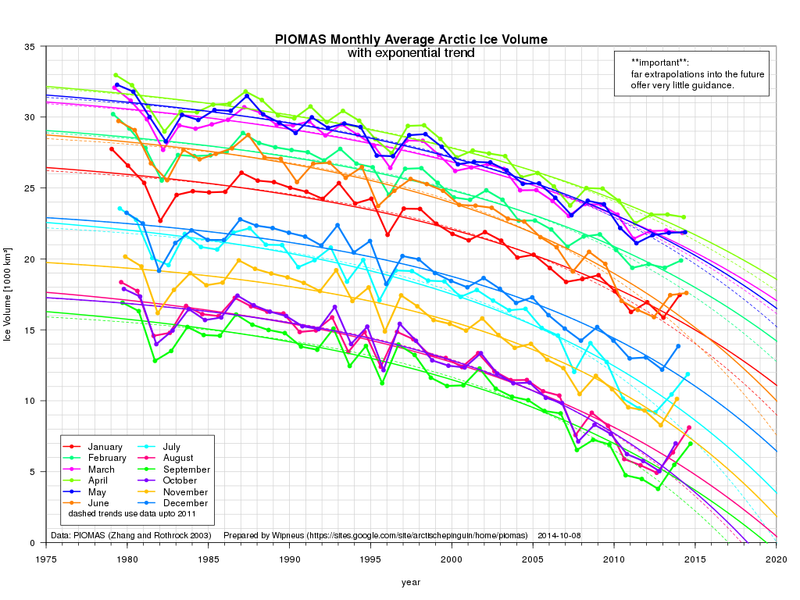 While the Arctic lost more ice cover in 2007 than in 2005, less carbon was taken up by the ocean in 2007 -- an unexpected finding, in light of the theory that less sea ice leads to more carbon stored. "Manizza traced the discrepancy to the Greenland and Barents seas, regions of the Arctic Ocean that take in warmer waters from the Atlantic. (In warmer environments, carbon is less soluble in seawater.) Manizza observed this scenario in the Barents Sea in 2007, when warmer temperatures caused more carbon dioxide to be released than stored." 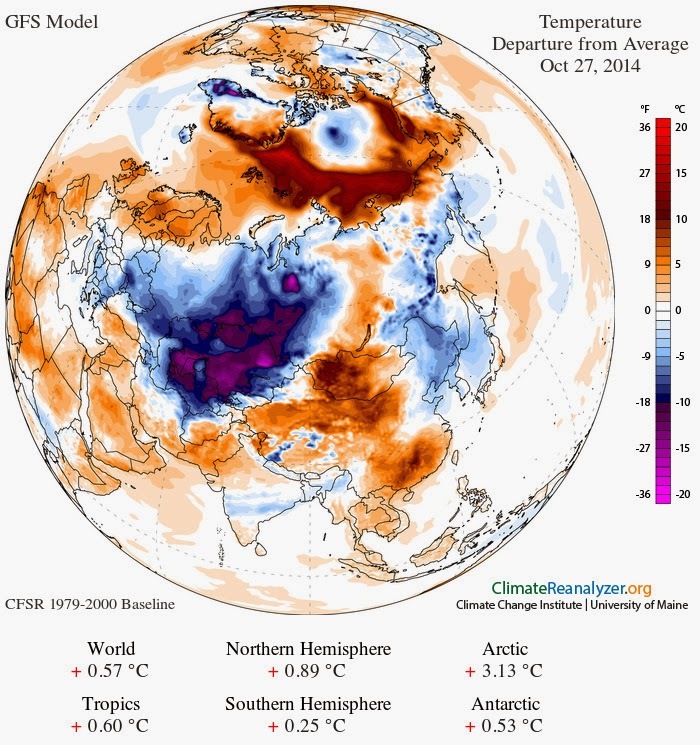 The Arctic Ocean: An Increasing CO2 Source? 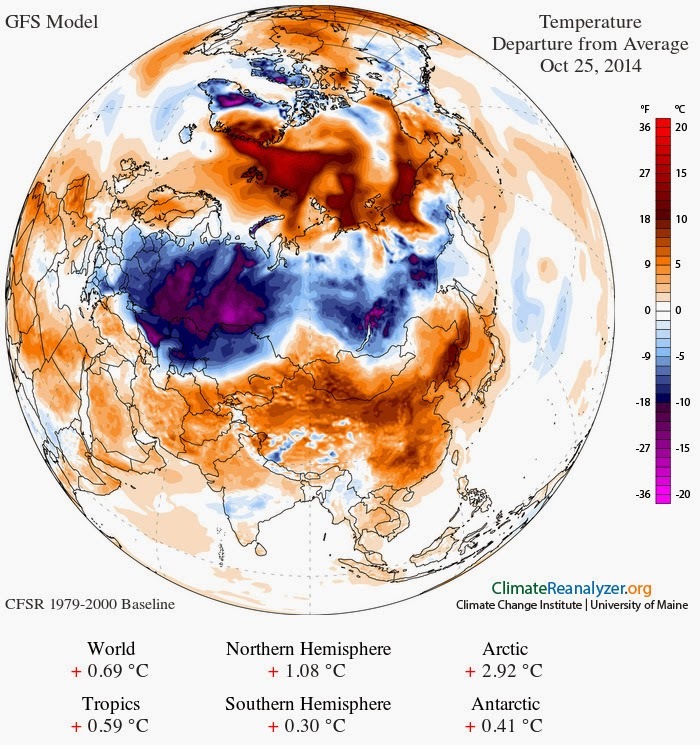 While Manizza discovered that warmer water in the Barents Sea led to release of CO2 - the Arctic Ocean becoming a source of emissions, this has not been recognized, or accepted by other scholars who assume that the additional open ocean will increase the ability of the Arctic Ocean to absorb CO2, and increasing acidity over time. 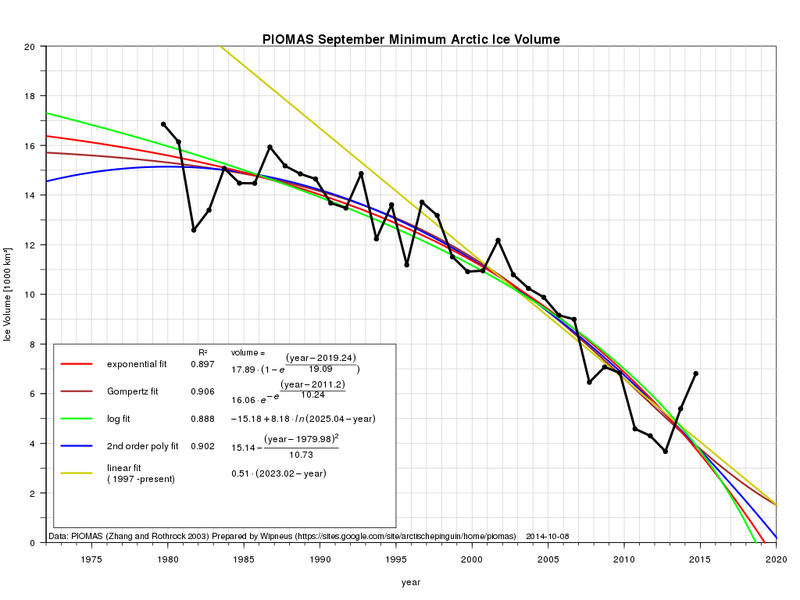 However, there seems to be some data that might illustrate the Arctic potential as a CO2 source may be increasing. 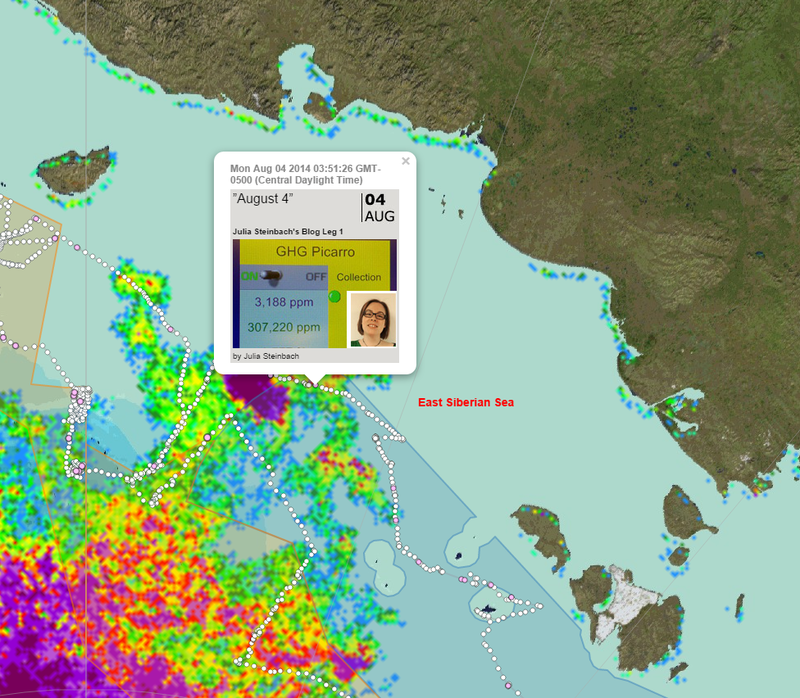 For example, during June through September, 2013 O-Buoy #7 recorded CO2 of almost 480 ppm. 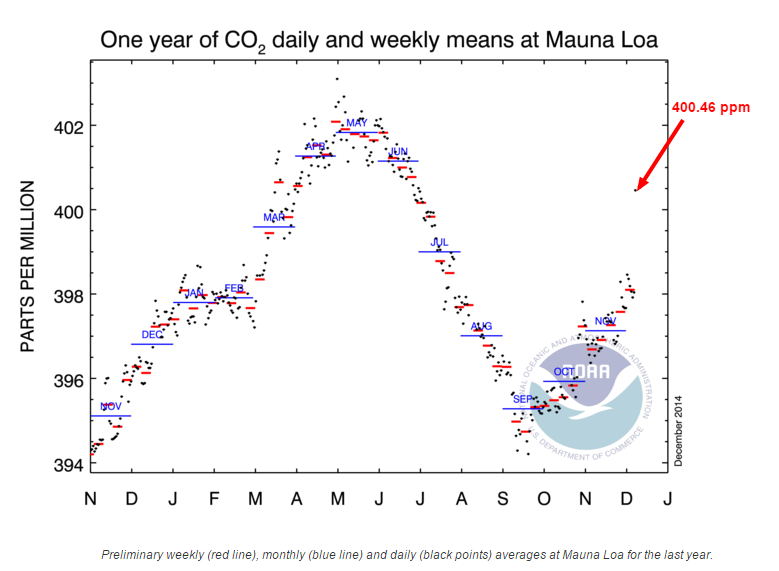 the following is the CO2 readings from June 3 to July 3, 2013. Here is the longer trend - about 6 months of data with readings above 400 ppm well into September, 2013. "Now begins the interesting things happen with the chemistry. The oxygen concentration becomes low, near the ground (sea floor), a clear signal to the decomposition of organic materials. This also means that the carbon dioxide concentration is high. The most surprising is that the carbon dioxide concentration is also high in the surface water, so high that it is above the equilibrium level of the atmosphere. Thus carbon dioxide is leaking out of the sea in this area. Normally the sea under-saturated during the summer when växtpankton (plankton) bloom. The reason that it is over saturated is probably due to the supply of organic matter from land that is broken down to a greater extent than the phytoplankton bloom. This was something we observed during an expedition to the sea in 2008, but in areas closer to shore than where we are now." What makes this intriguing - and troubling, is that the charted path of SWERUS_C3 is no where near land, this is not likely decaying debris washed out to sea. the course seems to be what is thawing on or under the sea floor itself.